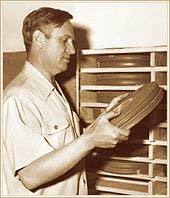 1961: Gene Autry's personal collection of all of his films. Gene appeared in 93 feature films. Some of his best known movies are based on his hit records, including South of the Border (1939), Mexicali Rose (1939), Back in the Saddle (1941), The Last Round-Up (1947) and Strawberry Roan (1948). This is Gene's full filmography. You can click on a title to view film information, see lobby cards or view movie stills. This is an alphabetical listing of Gene's full filmography. You can click on a title to view film information, see lobby cards or view movie stills. For more information about any of Gene's films, please contact Gene Autry Entertainment.